Nickolaus Typaldos, Mineral Mountain Boogie Boogie, 2017, cast urethane resin and aluminum powder, 23 x 14 x 2". 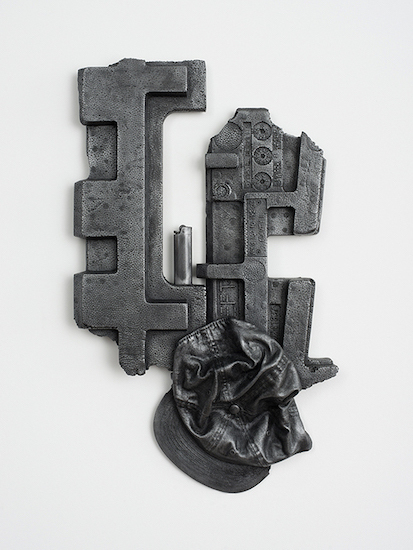 Nickolaus Typaldos’s current exhibition evokes a future time, in which synthetic objects have become petrified along with their organic counterparts. In this small gallery, the artist has hung four sculptures that, cast from resin and aluminum, echo space rocks and pewter. In Cloudy Old Harry (all works 2017), an unidentified bulbous shape pokes through a scrap of bubble wrap to form a tumorous lump, while in Mineral Mountain Boogie Boogie, a floppy baseball cap and a Bic lighter are fused to chunks of molded Styrofoam. Nearby, some loopy rope spelling “Anthem” riffs on the desperation of jingoistic sentiments. Although these cast objects recall archaeological specimens, their uncanny surfaces and prop-like appearances take us into an imaginative, science-fictional space. Typaldos’s pieces also call to mind Jasper Johns, in particular, the elder artist’s ancient-looking metallic lightbulbs and flashlights of 1970. This exhibition thus occupies a curious position between the midcentury neo-Dadaists, who were already recycling the readymade strategies of their early-twentieth-century forebears, and our contemporary moment, wherein discarded things carry the discomfiting aura of capitalist nihilism. The exhibition’s tone is one of a conflicted elegy—detritus here is at once lamented and fetishized. A couple of cast-paper plates, Eclipse Deceiver and Deep Space Dickens, deepen this effect, signifying the entwinement of brash disposability with the more gratifying corners of American culture—the culinary accoutrements of county fairs and taco trucks, for instance. Meanwhile, the disorienting effect of living through the twilight of consumerism is echoed by a large vinyl wall adhesive titled Interior Inversion for a Room. This mural presents a concentric, Op-style diamond pattern, at once exhilarating and nausea-inducing. If Typaldos’s approaches are sometimes familiar, his mimesis of our capitalist surroundings possesses a shrewd and captivating candor.